I got back to Blender today and quickly added some twigs to the lower-level branches. I was almost done and it crashed so I had to do it again … faster the second time, so there's good and bad with that. My eyes were going a bit crazy trying to see where to place things as it got quite dense. I think it's too cluttered with branches to permit leaves to hang off the twigs (at least without getting all tangled with one another) but I'll have to wait and put fresh eyes on it another day. 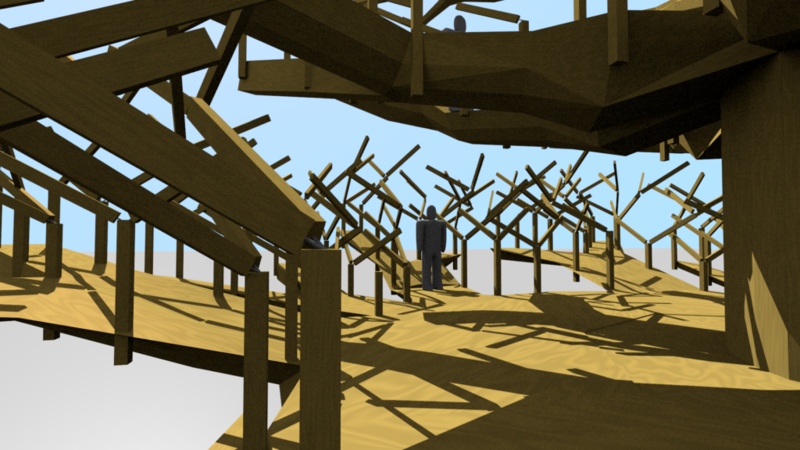 3D-render with guard rail posts, small branches and twigs on the lower level. Person standing on the lower level with guard rails, small branches, and twigs visible. I'm not thrilled with this result, and having only added 50 twigs, it's not enough to get close to my earlier estimates of the number of leaves for solid coverage. I figure I'll have about 4 spots for leaves on each twig or branch. 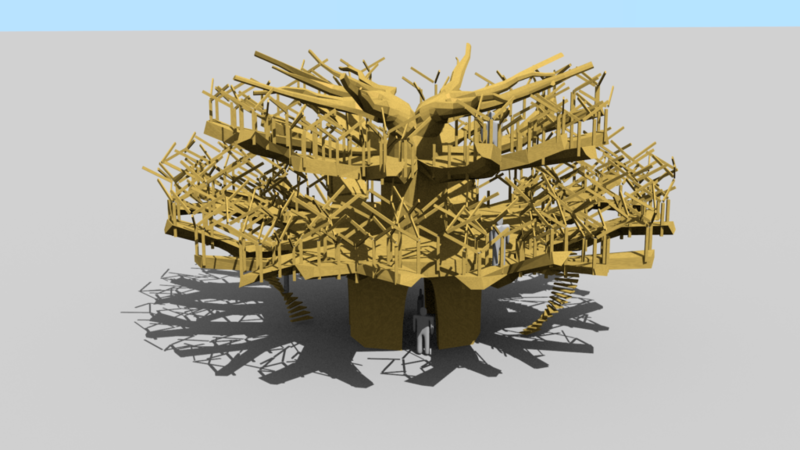 In these images, there are 268 lower small branches, 50 twigs, and 124 upper small branches for total of 442. With 4 on each one, that's only 1,768 close to the sparse fill with 1,900—although that was an even distribution on a hemisphere and not in a pattern mostly on the outer sides. By not filling in the top, it makes for an odd kind of tree, but one that seems to look okay looking from the ground.